To kick things off, I decided to go with a cookie that has quickly become a new favorite and will probably be a regular staple on our Christmas cookie plate. 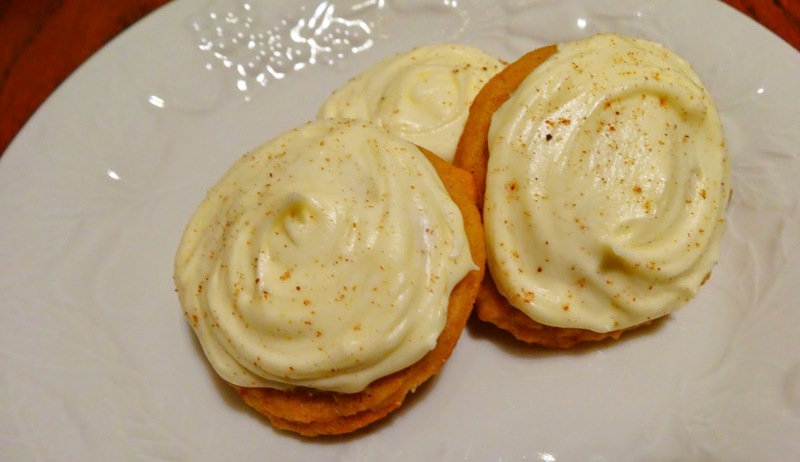 These cookies are soft and delicious; eggnog-y, but not overpowering. Preheat oven to 350 degrees F. In a large mixing bowl, sift together the flour, baking powder, salt, nutmeg, and cinnamon. Set aside. In another mixing bowl, or the bowl of your stand mixer, beat butter and sugars until light and fluffy - 3-5 minutes. Mix in the egg yolks one at a time. Mix in the vanilla and eggnog. Working in batches, mix in the dry ingredients until just combined. Drop cookie dough onto a parchment lined baking sheet in heaping tablespoonfuls, about 2 inches apart. Bake 10-12 minutes. Allow to cool 5 minutes on baking sheet before removing to a wire rack. When cooled completely, frost with Eggnog Frosting and sprinkle lightly with nutmeg. Makes about 3 dozen. In a large mixing bowl, combine butter and eggnog and beat until smooth. Mix in the powdered sugar with the mixer at its lowest speed.